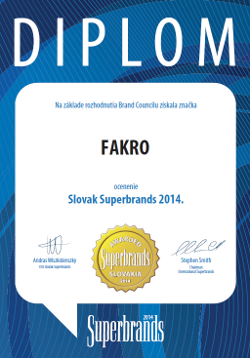 We are pleased to announce that FAKRO brand has been granted Superbrands 2014 prize in Slovakia. For the FAKRO Company it is very valuable distinction and confirmation that we have managed to create a recognizable global brand. This would not be possible without customers who choose FAKRO products, trading partners who together build credibility and position of FAKRO brand on the Polish and worldwide markets as well as without employees who contribute to the development of the company. Thank you all very much. FAKRO, in additio n to efforts to ensure high quality production and development of markets, focuses strongly on economic development of our country. The more valuable is the information that Polish products are appreciated and promoted abroad. Superbrands Awards called Oscars of the Marketing evaluate the most crucial things: strength and expressiveness of the brand. The most effective and long-term marketing strategies and integrated actions that build the brand awareness are awarded. Superbrands organisation chooses the strongest brands present on the market. Awarded companies are part of the top elite. Being a member of such group raises prestige of the brand, company and all employees. In many countries, Superbrands title is an important criterion for consumers' choice. This is possible thanks to clear rules for nominating and awarding as well as competent work of independent Superbrands Council (jury), which is made up of leading business representatives, marketing research institutes, advertising agencies and the media. It is not possible to apply for Superbrands title or just buy it, because the prize is granted by the jury completely independently and therefore it is so valuable.